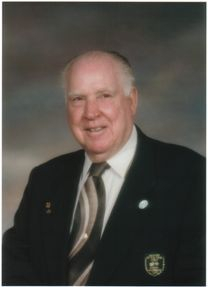 Reg Ward Sr. obtained his life agent's license in 1967 after leaving Ontario Hydro. He began working for the Monarch Life Assurance Company which was purchased by North American Life Assurance in 1984. He then obtained his life broker's license with several companies in order to offer his clients a wider range of product and service choices. Reg Sr. received his Chartered Life Underwriters Designation and is a Life Member of the Million Dollar Round Table. He has won many awards for his sales ability, quality of service and is highly regarded by his peers for his abilities, knowledge and integrity. Although he retired in 2007 he still comes into the office frequently to keep an eye on the business. He is the solid foundation of our business. In 1983 the business of A J Allin Insurance Brokers in Cobourg was purchased. Our business moved from offices in the family home to the office used by A J Allin Insurance. In 1984 we moved to the Elektra Television building on Division Street. Then in November 1992 we purchased our current office building at 409 Division Street. In January 1996 we purchased Lockhart Insurance Brokers in Hastings and Campbellford. In March 1997 the Hastings office moved into our own building on Front Street East where it remains today. Our Campbellford office is now located on Front Street South, sharing space with Royal Lepage Realty Services. We have enjoyed steady growth over the years and have come to be recognized as one of the leading brokerages in the area. We have earned a reputation for professionalism due to the special attention we give to the needs and requirements of our clients. We have strived to provide all clients with the upmost personal, family style of service and believe that is the cornerstone of our business success. Reg Ward Insurance Services Ltd. is a professional organization dedicated to providing the best available insurance products at the most reasonable costs. Our firm is registered as a licensed insurance broker with the Registered Insurance Brokers of Ontario (RIBO), which regulates the licensing, professional competence, ethical conduct, and insurance related financial obligations of all independent general insurance brokers in the Province of Ontario. We can provide personal and commercial lines of insurance, group and individual health coverage, and individual life insurance. By providing outstanding service and assistance to our customers, we have established a base of customer referrals as a major source of business. Our insurance companies also recognize that we perform for them beyond just selling insurance. This reputation has distinguished our brokerage as a top performer with both our clients and companies. We would be pleased to welcome you into our family!